GRUFFLING is a whimsical project about goats. It is part of the West Brunswick Sculpture Triennale (wBST). GRUFFLING began as an intuitive response to visiting one of the wBST sites, a slightly shabby, middle-sized, grassy suburban backyard. I have always wanted to work with a goat, but have never had the opportunity, and I figured this might be the right time to begin. As it has trotted along, the GRUFFLING project has wended its way towards the phenomenon of keeping goats in the inner-city. My meeting with Steve and his goat Maxi was particularly enlightening in this regard. 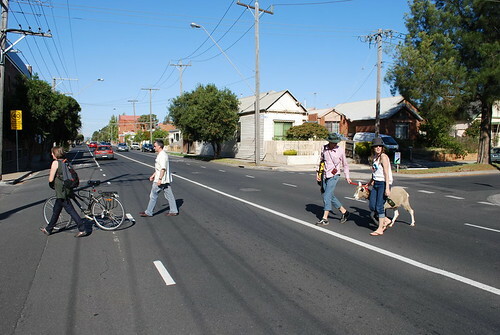 At the wBST, I plan to go for a walk with a goat through the suburb of west Brunswick on the weekend of March 21-22, 2009. This plan may or may not come to fruition. The lucky thing about being a blogger is that whatever happens (even a failure to achieve my not-very-lofty ambition) is able to be considered a part of the project. Life is long, and one day I will work with a goat, for sure. Acknowledgements: big thanks to Steph and Tim from Sugargum Farm, Stuart Harrison, Lisa Kelly, Scott Mitchell, Bianca Hester, Terri Bird, Daniel Van Cleemput, Claire Orrell, Brad and Red from ABC Melbourne, Deborah Kelly, Charm Watts, Farmer Darryl, the folks at Ceres, Toine the eight year old goat wrangler, and of course, Bob. Here’s an article that came out in Melbourne’s The Age newspaper, featuring Bob the Goat!